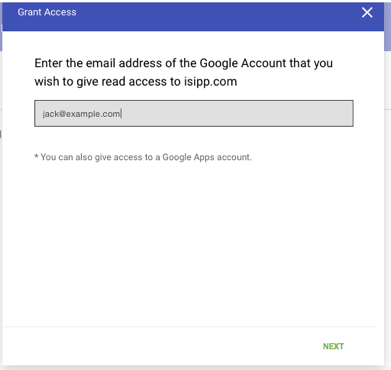 The one caveat is that you can only share this access with other Google or Gmail accounts, by which we mean the email address you enter for whomever you want to be able to see your data must be associated with a Google account. It does not have to be a Google or Gmail email address, but it has to be associated with a Google account. For example, if jack@example.com is associated with a Google account, then jack@example.com can have access. Here are step-by-step directions, followed by a nifty animated GIF created just for you by one of our team members! Making sure that you are signed in to your Google account first, go to your Gmail Postmaster Tools homepage. Hover over the three vertical dots on the right-hand side, and select ‘Manage Users’. On the ‘Manage Users’ page, click the white + symbol on the red circle. In the pop-up, enter the email address of the person that you want to grant access your domain’s Postmaster Tools data. That’s all there is to it, in fact it almost feels too easy! Important Note: Google does not send a notification to whomever you granted access, you have to tell them that you have done so, and when they log into their own Google account, they will be able to see your data. If you are already using Google's Gmail Postmaster Tools, guess what! You can share read-only access to this valuable data! (If you aren't already signed up for Gmail Postmaster Tools, see our tutorial on how to sign up for Google's Gmail Postmaster Tools.) There are any number of reasons that you might want to give someone else access to your data; here at SuretyMail we use it to review our customers' inboxing versus spam-foldering at Gmail so that we can help them fix anything that may be causing them to not achieve the best inboxing possible. This article originally written on August 11, 2017, and is as relevant now as when it was first written.